To be rather ignorant, I can't wait for this referendum to be over. I'm finding it hard to walk down the road, have a conversation or just scroll through social media without opinions being shoved into my face. But you see I'm a bit of a hypocrite. Because I'm not actually sick of both sides being shoved in my face. But rather one side. A backwards side. Am I wrong for writing that? Probably! I have been brought up in a democracy. I have lived 29 years where in my life, everyone has different opinions. Women have fought for them. Sure aren't we entitled to them? But right now I just can't except the opinions of what are coming from some people during this referendum. In fact, having heard the opinions of some people, some people that are close to me, I don't think I can ever look at them in the same way. I would be much more grateful if I hadn't heard their thoughts. Their two cents. I would be blissfully ignorant. Because I actually feel angry when I think about them now. How am I supposed to talk to them normally when all I feel is disgust in the pit of my stomach? Is it immature of me to not see past that this is their own opinion and that they are entitled to it? I wish I could, but I can't! I have a side ways head tilt now when I talk to them. Because I just can't get my head around the backwardness of it all. And I'm frightened. I'm frightened for the future of this country. Frightened at what the outcome of this referendum may be. Frightened that Ireland may still be in a backwards state. Educate yourself. Understand what this referendum is really about. And visit refcom2018.ie that produces an independent guide. All I know is that we have an opportunity to use our vote this Friday. A vote that past women (and men) have fought tiresomely for. While I won't tell you who to vote for, and I haven't told you who I am voting for, all I can stress is the urgency and the importance of expressing our right to vote. Don't abandon that. Olivia Von Halle (Brown Thomas)- these have a €100 discount in BT! Artis 5 piece collection (Brown Thomas)- these have a €35 discount in BT! Giorgio Armani Si Nacre (Boots)- smells divine! Adidas long sleeve t-shirt (ASOS) 20% off everything this weekend! Tasting menus you say? Sure that's just a plate with a leaf on it and some drops of sauce right?! Wrong! I swear by them. They are the best way to experience different food groups, cooking techniques, and I simply love them because you've no idea what is coming out from the kitchen and if you will enjoy the dish. It's like a spectacle. The only draw back for tasting menus for me have been the price of them. They usually run into the 80+ mark and it's just not a viable choice as a dining option for me at the moment. Don't get me wrong though...the heavy prices are usually reflective of the quality of food and the people behind the produce. Some of the best dining experiences I have had to date have been with a Tasting Menu- LOAM and ANIAR (both in Galway!) were out of this world! Dining out is definitely mine and Ev's thing...we aren't really into spending our money in the pub on a weekly basis and always jump at the chance to try a new place as we love food with whatever left over cash we have. But as we are in the midst of deep saving, lavish meals out have been put on the burner, despite me always trailing and lusting over restauranteurs social feeds! Roll on Brioche who have put on a tasting experiment programme the last few weeks- 5 courses for a mere €29. Only a provisional time slot has been put on for this experiment, but I really hope it comes back as it was fantastic fun. Five surprise courses and all were super. But my favourite had to be the ceviche and kimchi plate- I am loving fermented and cured foods at the minute so that was totally up my street. Brioche is a great little spot. Spot on decor. Great and knowledgable service. Open kitchen- I love when I see this in restaurants. And located in Ranelagh- possibly one of my most favourite locations in Dublin! Have you any hidden gems? Recommendations? I have struggled with bitterness for some time. It's actually consumed me. Consumed my daily train of thought. Consumed every day actions. Consumed my relationships with family and friends. I think the bitterness began when I felt the need to constantly compare myself to others. What others had/are achieving and why did I feel like I was falling behind. People have said what have you to be bitter about? Your healthy, your engaged, you've a business! And then I feel guilty. Guilty for having an emotion such as bitterness. Since a child, I was an overachiever. If I was to whip out old school reports- they would always be glowing in praise. I couldn't ever settle being just ok when I was young. I had to be good at everything, a high achiever. I always wanted good grades. I always wanted to receive praise. Not even wanting to receive. I CRAVED praise. I loved winning awards- student of the year this...top of the class for this...highest score of a grade etc...! I loved seeing words such as 'enthusiastic', 'bright', 'ambitious' and 'intelligent' next to my name. They were goals. I suppose my first smack of reality and dissapointment and I kid you not, I still think about was at the beginning of Year 6 in my primary school in London. I loved the idea of being a head girl so badly. I was obsessed with Enid Blyton books and had gotten the idea in my head that if you were a head girl you could go on to do great things- that people would want to work with you. Yep at the tender age of 11, I had began to think about the workforce! I wasn't picked as Head Girl. I wasn't even nominated for it and it stung. My third smack of reality was two years later in my final year in Dance College in Dublin. We were rehearsing a contemporary piece and two of the girls in my year were using paper as a prop. Just some random paper that the office were going to recycle. I just happened to open up the piece of a paper and it was a printing of where everyone in my year had been accepted to in the UK for further training. My name was missing. I don't even know why I was so surprised because of course my name was missing. I didn't get in to one college in the UK. So why would my name be printed? But it stung...it stung so bad. I unashamedly sobbed in college that day in front of everyone. Twenty year old me...wailing. I cried probably every night solidly for about month after that also. I felt like a failure. I was a failure. And I don't think at that time I was happy for anyone else who had achieved. Because I was too bitter and worried about my own failings. My stubbornness can be best described as a raging bull. Most people would pick themselves up and try again the next year. Not me. I abandon and move on and set my sights on University. NUI Maynooth to do a degree course in Business and Management. Something I had no experience in. I didn't even take business as a subject in my Leaving Cert in school. But I thought I would be good at it and was playing with the idea of opening up my own business when I would graduate so thought it would be useful. I also thought I would sail through it. I was good in Primary school. I was good in Secondary school. I actually didn't even need to try super hard and did really well. Well college is different and while I still ended up with a first, I wasn't top of my class. I didn't possess the skills that have seen some of the graduates of my year excel in work life. Some of these people are working in top companies. And I suppose the nail in the coffin for me was last year when I was declined twice for a mortgage. I am so fiercely competitive and crave independence that it full on destroyed me. I spent months after that over-analysing everything. Comparing myself to other friends. Friends who had gotten married. Who had got accepted for a mortgage. Who were having kids. And I cried. I cried all the time. God love Evan and my family for putting up with me. I was awful to be around. Cried driving. Cried cleaning. Cried when I went to the toilet. I picked fights. Was more blunter then ever. But more severely grew this rage of bitterness which just began to consume me. I was so angry. And so I am trying. The awareness of the bitterness is a first step I think right? It's the challenge of not letting it take over is my second step. I don't even like putting it down to as a second step. Because it's on going. It's exists and then it doesn't. The one thing I really do agree with more then ever is the idea of comparison being the thief of joy. There is simply no need for it. I stumbled upon this writer- Rupi Kaur. 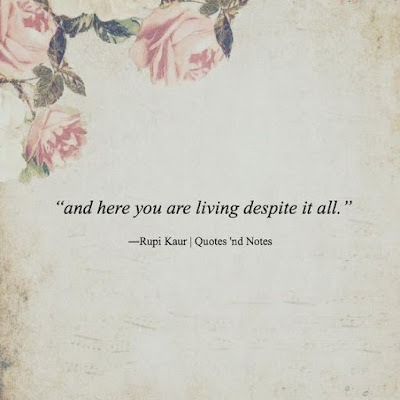 And one of my favourite things she has written was this sentence; 'and here you are living despite it all'. Yep I guess I still am living. Still looking for a gift for a female- did you catch my last post? Adidas NMD XR1 (JD Sports) This colour way is unreal. And I am pretty obsessed with NMD's at the minute. Mr Jenks Pocket Square- Dublin skyline (Mr Jenks) I actually bought this for Ev prior to Mr McGregor wearing it- it's 100% silk and has Dublin's iconic and historic sites on it. And I also love Mr Jenks vision- a trendy accessories company for men and it's Irish! Matt & Nat holdall (ASOS)- currently has 30% off and is perfect for when he brings you on that getaway you now deserve....lol! Ugg Scuff slippers (Brown Thomas) He will live in these...promise! The Mixer's Manual (Brown Thomas)- so he can channel pre sofa jumping Tom Cruise. Adidas Original NMD XR1- (JD SPORTS)- I have always been a Nike girl, but the last few season's, Adidas have upped their game. These are dope! Chanel Coco Mademoiselle- (Debenhams)- Will always be my favourite and there is 15% off still! Givenchy Antigona mini pink tote (Harvey Nichols)- Sooo cute and Barbie-esque. I would pop a fluffy pom pom key chain on the end and voila. Victoria Secret Varsity crew jumper (Victoria's Secret) and these yoga tights I swear by- January sofa sloth's outfit sorted. Shonda Rhimes 'Year of Yes' (Amazon)- This women is amazing and I have been dying to read this book. Miasma essential oils (Holland and Barretts)- They are currently half price and I swear by them. I put oils in my diffuser at night time and totally chill out. MAC Eye shadow Amber times Nine (Brown Thomas)- must have neutrals. Helen Moore leopard faux fur scarf (My Shining Armour)- obligatory leopard. Lace Triangle bra (Topshop)- every day I am loving more wireless bras. It's like letting them breathe. Olympus E-PL8 (Camera.ie)- the Pen's have a good reputation of taking decent still shots while also filming. This Works Sleep Plus spray (Look Fantastic)- I've used this product before and it's amazing! Highly recommended. Terrys Orange (Tesco)- Because it's Christmas right? !